The Roman Empire has gone down in history as one of the civilizations which considered water an essential element on its living. Aqueducts ensured water supply to all the population, the Roman baths were used as social meeting places and also as a place of relaxation and personal hygiene and the fountains were built to decorate public squares. Nowadays, Rome still preserves some of the architectural works related to water. The Roma City Tour official tourist bus approaches you to some of these places. If you are interested in visiting them, you can take the most of the hop-on hop-off service: get on and off the tourist bus as many times as you want during the 24, 48 or 72 hours of the ticket. 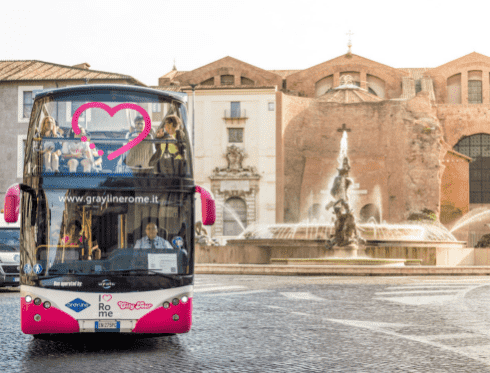 With Roma City Tour panoramic bus you can get to the Fontana di Trevi, the Barcaccia (located at Piazza di Spagna), the Fontana delle Tartarughe, the Fontana del Nettuno (located at Piazza Navona), the Fontana del Tritone (located in front of the Palazzo Barberini) and many other points of interest. Among all the fountains, you should definitely visit the Fontana di Trevi, which is the largest fountain in Rome and involves a legend which says that those who throw a coin inside the fountain they are destined to return to the eternal city. 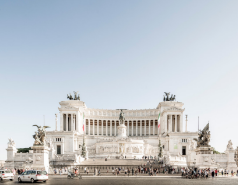 For sure, after visiting Rome, you will want to go back in the future, as you will love the atmosphere of the streets of Rome, the monuments located at every corner of the city, the ancient art, the delicious gastronomy and the uncountable list of attractions of the city. 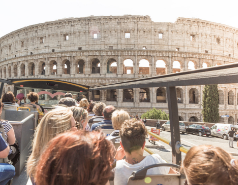 The official hop-on hop-off bus service will help you to discover the most important facts of Rome because of the information provided by the audioguide service available in 13 languages.